Employees are your best asset and greatest liability. We will provide all the help you need with our personalised attention, pragmatic straight-talking advice and your own HR portal. We are always at the end of the phone for advice or we can visit if you need some hands on help! Maintaining HR compliance in the workplace is difficult. With ProcessWorx compliance becomes simple. We have everything you need, from employment contracts to online inductions. We keep you and your Portal up to date so you don’t have to worry! If you have employees, we can help. Our cloud-based portal provides an easy and secure way to access all your HR documents. Owners and managers can access documents like employment contracts, job descriptions, performance management procedures. 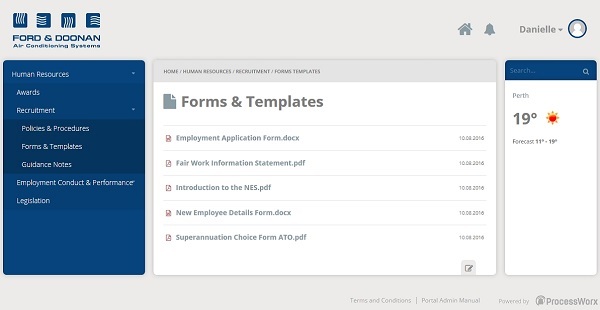 Employees can access all the forms and templates they need – like leave forms, expenses reimbursement forms etc. All documents on the portal are branded with your logo and are automatically updated to be compliant with current legislation. Get started with ProcessWorx now!